An operation which took all night to complete saw the boat being lifted from the seabed just after 7.30am. Skipper Duncan MacDougall, 46, and crewman Przemek Krawczyk, 38, were still aboard the prawn trawler when it sank on January 18. A barge with a large crane attached raised the boat clear of the water took and took it to nearby Portavadie for salvage work to continue. Last night a spokesman for the Crown Office said: “Work has been ongoing overnight and today to raise and secure the Nancy Glen. “Salvage teams who have been on board the vessel have described finding human remains. “While the vessel has now been lifted clear of the water, it remains unsafe for specialist officers from Police Scotland and the Scottish Fatalities Investigation Unit to enter the boat and complete the recovery and identification process. This process will not be completed until it is deemed safe to do so and the specialist teams will remain on standby. “The families are being kept up to date with the progress being made. 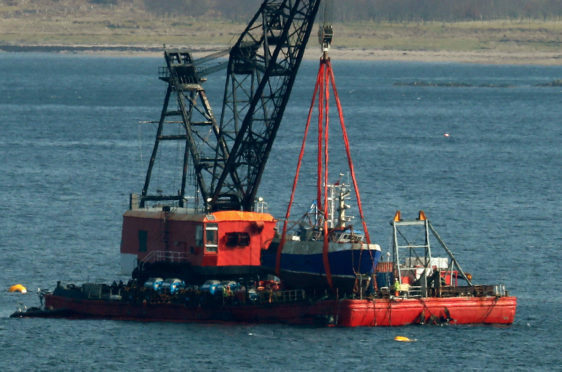 The vessel sank near Barmore Island while returning to its home port of Tarbert in Argyll. It was lying at a depth of more than 460ft before the complex lifting operation was carried out. Following a fundraising campaign by the Clyde Fishermen’s Trust to “Bring Our Boys Home” the Scottish Government agreed to cover the costs of the salvage operation, which are in the region of £1million. The decision by the Scottish Government lift the boat means that all of the money raised by the campaign can go to support the men’s families and the survivor, John Miller, who was rescued from the sea by a fish farm boat. There has been a huge outpouring of support from the local community following the tragedy, with individual donations and fundraising events raising a total in the region of £300,000. A candlelit vigil took place by the harbourside, with a large candle left burning on the quay to stay lit until the men were returned to their families.